When you care for someone you love that you only give what’s best for them – share the health of your heart. 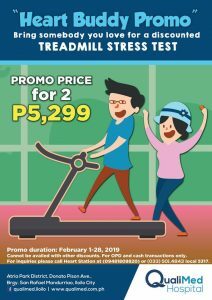 This February, get discounted Treadmill Stress Test with someone you care about. Get the Treadmill Stress Test for 2 for only P5,299! Contact our Heart Station at 033-5014843 local 5317 or mobile number 09481809820 for inquiries on schedule of appointments.